Rather than trying to wow you with our take on the latest food trends for this current holiday season, I wanted to take us back to the classics. Well, the classics of my family to be exact. This is the menu we have every. single. Christmas Eve. I’m talking for decades. Apart from a few additions, courtesy of Robert and I, and my sister and brother, this menu is wonderfully the same from year to year. That’s what makes it so special. My mom grew up in a Maltese-Sicilian American, immigrant household in the 1950’s and 60’s. Her Grandmother immigrated from Valetta, Malta to the United States and ended up in Rochester, NY. She was a bootlegger during prohibition, my favorite thing to tell people about her, and a wildly resilient woman. Christmas growing up for her was very traditional and very Italian. My Grandfather was first generation Sicilian-American, and a butcher by trade. With parents like hers, food was the stronghold of that house for my mom growing up, and Christmas Eve was no exception. 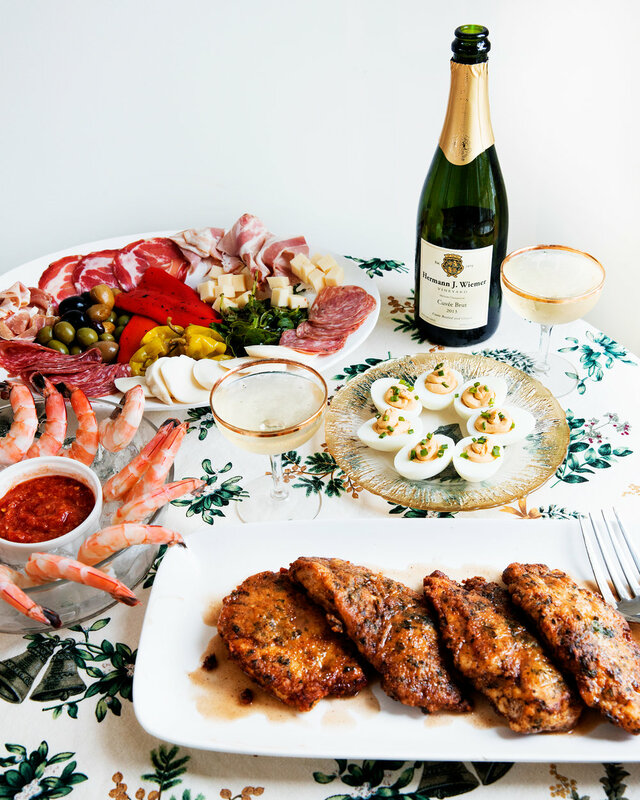 You may have heard of the seven fishes meal? 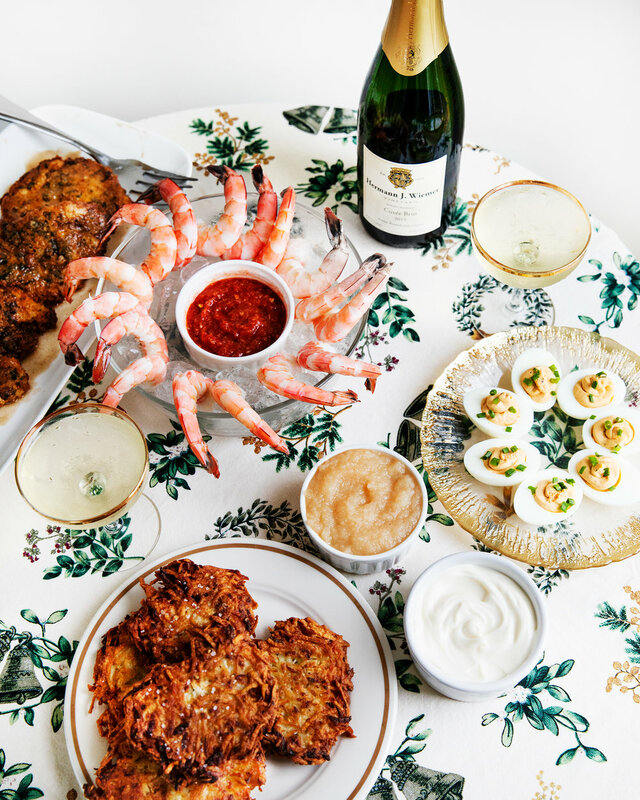 It’s an Italian-American celebration of Christmas Eve with fish and seafood dishes, and that was just the beginning of their night. She would bop to different with their parents and sister, celebrating Christmas Eve with one meal after the other. If you’ve been to someone’s home who is Italian during the holidays, this probably doesn’t sound too crazy. The whole reason for the seven fishes and other seafood dishes came about, because you’re not supposed to eat meat until Christmas day. One particularly festive year, my mom remembers that just after they attended midnight mass, they continued the celebration by going to another relatives house where they had another meal containing meat (since it was technically Christmas day and all) and stayed on until 2 or 3 o’clock in the morning. I can only imagine how magical that all must have felt, staying out until all hours of the morning on Christmas, hopping from one party to the next? After hearing my mom recount these childhood stories, our Christmas Eve sounds so tame by comparison! I like to think that my mom took the best parts of her Christmas memories to create the traditions that we’ve had my whole life. She hosts anywhere from 15-30 people on any given year. Some years it’s quite small, others quite large, but the amount of food is always the same. We’ve never seemed to grasp the concept that we can dial it back if there are only 15 of us, as opposed to 30. Some of the years I remember so clearly, like the year my mom’s friend brought her sons and one of them was drinking red wine out of a giant goblet he found hidden in the china cabinet all night, or the year when I got a little tipsy rather early and decided it would be a great idea to take whoever would join me to go Christmas caroling (we carol every year on Christmas Eve before opening any gifts, I only recently learned that this isn’t a thing that many people do!) throughout my parent’s neighborhood. Somehow, we did manage to get some applause from a house at the end of the street. I like to think they had enough wine to not notice how unrehearsed and eggnogged-out we all sounded. Now, because he is so hands-on in the kitchen, with the introduction of Robert into my family there was no way he wasn’t going to add some flavor to our culinary Christmas traditions. He’s always helping out when we’re home for any type of event, so it was only a matter of time before something stuck to the menu that he suggested. After a couple of years of him being in charge of crab cakes, a task that he vehemently hates, he suggested adding latkes. I think he’s kicking himself for it now, but we have him to thank for the latkes that will likely never leave this menu again. If you’ve never made them, all I can say is they are well worth your effort. Robert cooked everything you see here, I handled the antipasto, and my angel of a mother made me pastizzi. I drove all the way home to Rochester to watch her make me a perfect batch, while I scribbled down what she said, because of course she doesn’t have a written recipe. Her Grandmother refused to write it down, so my mother began watching her make them as a child so she could learn. There was something really lovely about watching my mother and writing it down myself, so that I could learn. In case you’re curious about this strange thing I keep talking about, pastizz is a traditional Maltese street food (pastizzi is technically plural, but we say pastizzi across the board when referring to them). It’s a savory pastry that’s filled with ricotta, and has no shortage of lard. That’s the only way to make it, according to my tribe of Maltese-Americans, and if you’re worried about that part of it there is in fact organic lard out there in the ether. Some people make pastizz with mushy peas on the inside, but it’s not a version that my mom grew up with so she’s actually never made it. I’m so curious to give it a try, having eaten this ricotta version my whole life. When I returned home from my 24 hour pastizzi adventure, quite literally outrunning a blizzard that was on my tail, it really made my heart go pitter patter to watch Robert cook the rest of the menu in our kitchen. It brought everything full circle in this very beautiful, and unexpectedly emotional way. Food, and family traditions have a way of doing that, don’t they? As we worked to bring the menu to life, it occurred to me that this is not a particularly fancy, complex menu. Some components of it are, sure. I wouldn’t say Pastizzi is something you should plan to make on a random Tuesday, but all around I think this balance of 1950’s America, traditional cuisine of our culture, and a very specific dish of the region where I’m from, reminds me that I am home for the holidays. In every sense of the phrase. We haven’t included the whole menu, just the hits, the ones that really round the whole meal out. I didn’t realize how specific Chicken French is to Rochester, New York until people were staring at me with the classic “what in the world is that?” look when I referenced it. If you’re not familiar, it’s this pan fried, lightly breaded chicken that has a sherry lemon sauce that just tastes so good I can’t even properly describe it. Robert has often referenced chicken piccata when trying to get people to understand what it’s similar to, and while that works, it really is very much its own thing. My mom’s recipe is pretty specific, and it tastes different than ones I’ve had outside of her kitchen. This is key. Because I am her daughter, and because your mom always makes it best, I highly recommend trying out this version. 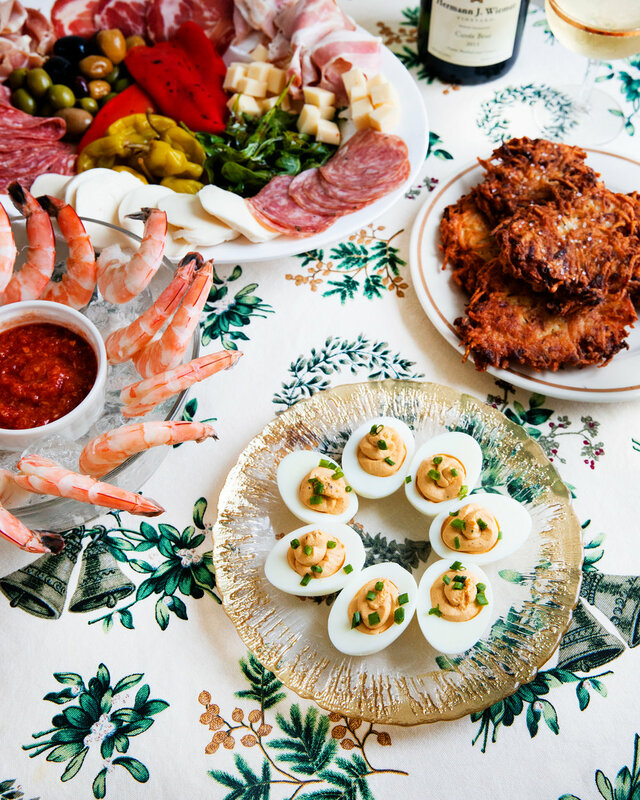 We also included Deviled Eggs, classic Antipasto, and Shrimp Cocktail, these are by no means showstoppers, but they are so delicious, simple, and they are what Christmas Eve is all about. 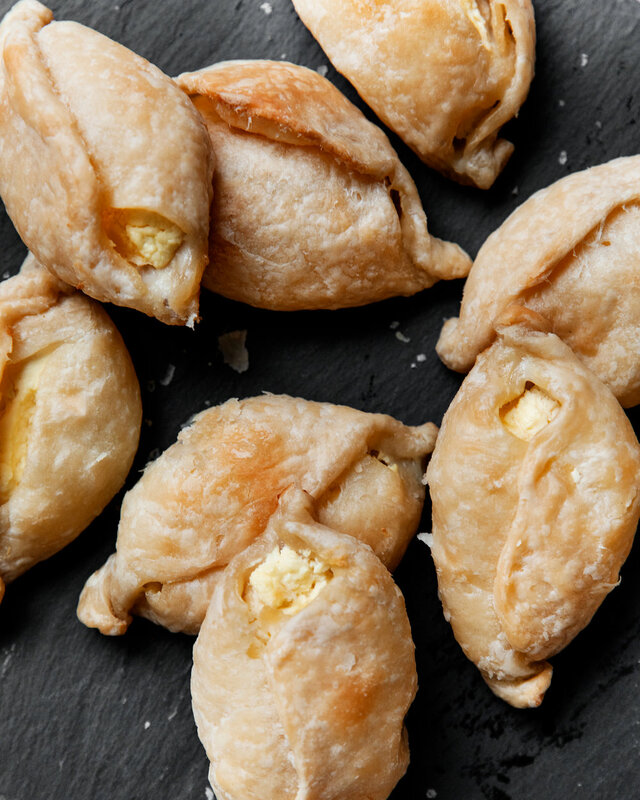 As you get together with loved ones in the coming weeks, cook together, have a glass of wine and go sing to your neighbors together… or even just call home, I hope you have the happiest of holidays, and if you want to take a stab at Pastizzi, I promise you have never tasted anything like them. we have these at every family holiday! To prepare the filling, whisk 4 lbs of ricotta and 4 eggs together until smooth. Refrigerate until ready to use. To make the dough, in a large mixing bowl, mix the flour, salt, and water by hand. You’re looking to create a very elastic dough here, so if you feel like you need more flour or water, add it. Continue to knead the dough with your hand until it’s completely smooth. Once the dough feels good, form it into a ball. To begin working with the dough, prepare a very a well floured surface. Working in batches, you’ll take a handful of lard and begin to rub it into the dough with your fingertips on the top layer of the dough. This part of the process is important. You want to really work the lard into the dough. Once you have enough lard worked in, roll the dough into a long snake shape and continue to work the lard through. Coil the dough back up into a circle. Re-flour your work surface and roll the dough back out into a flat circle. Repeat this 3 times until the dough is well saturated in the lard. Once you finish the rolling process, you’ll cut the final snake shape into 1” pieces. Roll each piece in on itself a few times to create a smooth round ball. To roll out the pastizz out, you need a clean surface and a few tablespoons of oil on hand. You don’t want to use the same surface as you did to roll the dough out, unless it’s cleaned. Dip your fingers in the oil, oil the surface, and smear your rolling pin lightly in oil. Roll one of your dough balls into a 4” oval shape. Carefully fold each side of the oval shape in, like your folding a blanket over it and twist the ends closed. Grease a baking sheet with lard and place each finished pastizz on it. Before baking, drop a small dollop of lard on each pastizz. Bake at 375° for 30 minutes, until lightly golden, rotating the pan halfway through. Serve it with a mixed green salad, and with olive oil + balsamic vinegar on the platter. Bring a pot of water to a boil over high heat. When boiling, poach shrimp until opaque and pink, about 3-4 minutes. Remove from water and cool in an ice bath until cold to the touch, about 5 minutes. To prepare shrimp, remove shells and devein. Squeeze lemon juice over shrimp and serve on a chilled platter or bed of ice. To make cocktail sauce, stir to combine ketchup, horseradish, sambal oelek, and lemon juice. Season to taste with salt. In a shallow bowl or small sheet tray, combine flour and salt and pepper, set aside. In a second shallow bowl or small sheet tray whisk together eggs, parsley, pecorino cheese and salt and pepper. Place both bowls next to each other and near the oven or stovetop. In a cast iron skillet or high-sided frying pan over medium heat, combine canola oil and 1/2 stick of butter. Butter will melt and begin to brown. When butter has browned, working in batches of 2-4 depending on size of pan, gently fry chicken until batter is golden brown, about 4 minutes. Carefully flip chicken and cook an additional 4 minutes. Remove from skillet and set on a cooling rack set inside a sheet pan. When cooking, butter and oil mixture will bubble and foam over chicken, this is normal and should not overflow skillet. When all pieces have been fried, transfer to oven and cook through until an instant read thermometer inserted into the thickest piece reads 160°, about 10 minutes additional. To make sauce, add lemon juice, sherry and chardonnay to warm skillet, gently scraping up all drippings. Over medium heat, reduce by one third and add 1 stick butter. Whisk to emulsify as butter melts. Season to taste with salt and pepper. To plate, pour sauce over chicken and serve with additional sauce on side. Using a food processor with a coarse grating disc or a handheld grater, grate potatoes and onions into a large bowl lined with a clean tea towel. After all are grated, very gingerly wring out as much moisture as possible from potato and onion mixture. Repeat 2-3 times as thoroughly as you can. Transfer the dry mixture to a separate large bowl. Add the eggs, flour, salt, baking powder and pepper, and mix until the flour is absorbed. Using an ice cream scoop or heaping tablespoon, divide mixture into individual portions, placing them on a sheet try or cutting board. Pour frying oil into a cast iron or heavy bottomed pan until you have about 1/4’’ of oil in the entire pan. Heat over medium high-heat until oil is shimmering and a small test drop of batter sizzles when placed in oil. Working in bathes of 2-6 depending on size of pan, transfer portioned mixture into skillet and flatten with spatula. Cook, undisturbed until edges are crispy and golden brown, about 5 minutes. Flip careful and cook an additional 4-5 minutes. Transfer latke to a cooling rack set inside a sheet pan and sprinkle with salt to taste. Peel and halve eggs lengthwise. Scoop out yolks and return egg whites to platter. In a nonreactive bowl, thoroughly mash egg yolks with fork until all large chunks are broken down. Add mustard, paprika, and salt and pepper, stir to combine. Stir in mayonnaise and season again to taste. Transfer egg yolk mixture to a pastry bag or zip-lock baggie with a small hole cut on the side. Fill each egg white with about 1.5 tsp of egg yolk mixture and top with chopped fresh chives.